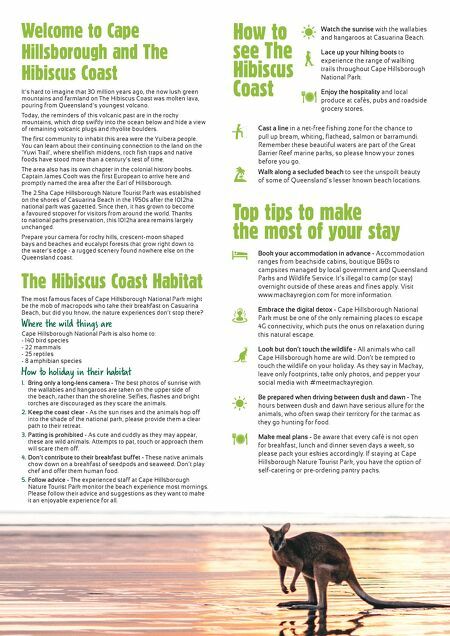 Welcome to Cape Hillsborough and The Hibiscus Coast Watch the sunrise with the wallabies and kangaroos at Casuarina Beach. 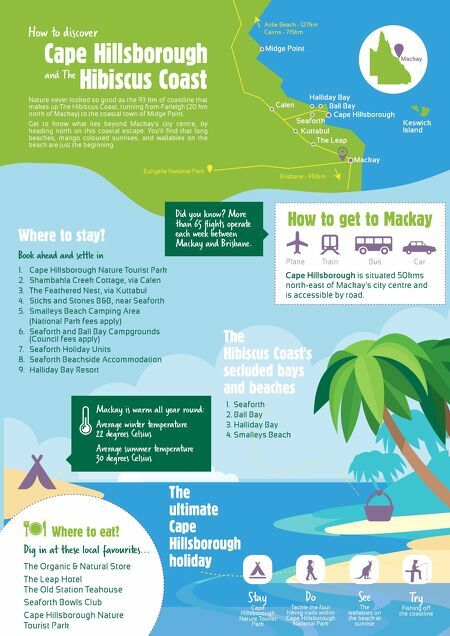 Lace up your hiking boots to experience the range of walking trails throughout Cape Hillsborough National Park. Enjoy the hospitality and local produce at cafés, pubs and roadside grocery stores. How to see The Hibiscus Coast Top tips to make the most of your stay Cast a line in a net-free fishing zone for the chance to pull up bream, whiting, flathead, salmon or barramundi. Remember these beautiful waters are part of the Great Barrier Reef marine parks, so please know your zones before you go. Walk along a secluded beach to see the unspoilt beauty of some of Queensland's lesser known beach locations. It's hard to imagine that 30 million years ago, the now lush green mountains and farmland on The Hibiscus Coast was molten lava, pouring from Queensland's youngest volcano. Today, the reminders of this volcanic past are in the rocky mountains, which drop swiftly into the ocean below and hide a view of remaining volcanic plugs and rhyolite boulders. The first community to inhabit this area were the Yuibera people. You can learn about their continuing connection to the land on the 'Yuwi Trail', where shellfish middens, rock fish traps and native foods have stood more than a century's test of time. The area also has its own chapter in the colonial history books. Captain James Cook was the first European to arrive here and promptly named the area after the Earl of Hillsborough. The 2.5ha Cape Hillsborough Nature Tourist Park was established on the shores of Casuarina Beach in the 1950s after the 1012ha national park was gazetted. Since then, it has grown to become a favoured stopover for visitors from around the world. Thanks to national parks preservation, this 1012ha area remains largely unchanged. Prepare your camera for rocky hills, crescent-moon shaped bays and beaches and eucalypt forests that grow right down to the water's edge - a rugged scenery found nowhere else on the Queensland coast. The Hibiscus Coast Habitat The most famous faces of Cape Hillsborough National Park might be the mob of macropods who take their breakfast on Casuarina Beach, but did you know, the nature experiences don't stop there? Where the wild things are Cape Hillsborough National Park is also home to: - 140 bird species - 22 mammals - 25 reptiles - 8 amphibian species How to holiday in their habitat 1. Bring only a long-lens camera - The best photos of sunrise with the wallabies and kangaroos are taken on the upper side of the beach, rather than the shoreline. Selfies, flashes and bright torches are discouraged as they scare the animals. 2. Keep the coast clear - As the sun rises and the animals hop off into the shade of the national park, please provide them a clear path to their retreat. 3. Patting is prohibited - As cute and cuddly as they may appear, these are wild animals. Attempts to pat, touch or approach them will scare them off. 4. Don't contribute to their breakfast buffet - These native animals chow down on a breakfast of seedpods and seaweed. Don't play chef and offer them human food. 5. Follow advice - The experienced staff at Cape Hillsborough Nature Tourist Park monitor the beach experience most mornings. Please follow their advice and suggestions as they want to make it an enjoyable experience for all. Book your accommodation in advance - Accommodation ranges from beachside cabins, boutique B&Bs to campsites managed by local government and Queensland Parks and Wildlife Service. It's illegal to camp (or stay) overnight outside of these areas and fines apply. Visit www.mackayregion.com for more information. Embrace the digital detox - Cape Hillsborough National Park must be one of the only remaining places to escape 4G connectivity, which puts the onus on relaxation during this natural escape. Look but don't touch the wildlife - All animals who call Cape Hillsborough home are wild. Don't be tempted to touch the wildlife on your holiday. As they say in Mackay, leave only footprints, take only photos, and pepper your social media with #meetmackayregion. Be prepared when driving between dusk and dawn - The hours between dusk and dawn have serious allure for the animals, who often swap their territory for the tarmac as they go hunting for food. Make meal plans - Be aware that every café is not open for breakfast, lunch and dinner seven days a week, so please pack your eskies accordingly. If staying at Cape Hillsborough Nature Tourist Park, you have the option of self-catering or pre-ordering pantry packs.